Calhoun Beach Running Club - we run for fun! 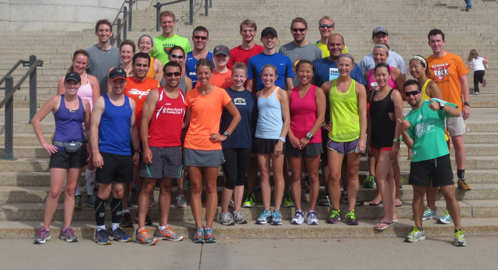 Welcome to the Calhoun Beach Running Club (CBRC), the premier run club in the Twin Cities area of Minnesota! Training for Twin Cities Marathon or another fall marathon? We have training programs designed specifically for you and can help you get that PR, that Boston Qualifier, or just help you make it across the finish line. We're currently training runners for Twin Cities Marathon, Chicago, Berlin, Melbourne, and NYC marathons. We'd love to have you train with us! And if you aren't interested in Twin Cities Marathon or marathon running in general, we can help you achieve your running goals whether they are training for a different distance, or just running to stay in shape! We're located in the Uptown or Lakes area of Minneapolis, amidst the most beautiful urban running trails in the United States. This is just one reason why to join! The CBRC combines great coaching, top-notch facilities, comprehensive training programs, fun runners, and social events into a package no other running club can compete with. We meet four days a week: Monday, Tuesday, and Thursday at 6 p.m. and Saturday at 7 a.m (8 a.m. during the non summer months). We meet on the hour, give announcements at 10 minutes after, and get out the door 15 minutes past. The running club meets in the Calhoun Beach Club, but you do not have to be a member of the CBC to join the running group. Many runners do become members, but those who don't still enjoy these amenities on run days: a warm, dry place to meet and stretch before hitting the lakes and access to locker rooms and showers. Please consult our faq list, and then contact us if you would like to stop by to try out the CBRC and learn more about us in person. Contact us to learn more or try us out in person!